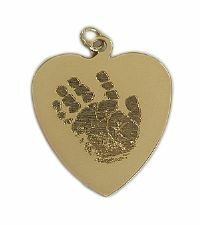 We offer two great options for Baby Handprint and Footprint Jewelry. You can select from "Our Signature Precious Images" if you don`t have a copy of your child`s actual handprint or footprint image. This is one of our most popular options for memorial and condolence gift giving, as the turnaround time is only 3-5 days. In addition to our signature handprint and footprint images, we also have 12 exclusive signature images that you can have engraved on your personalized charms, pendants, or key chains...including a Baby Angel, Angel Wings, Dragonfly, Butterflies, and Cross. Pieces from our Precious Images line can also be rushed for special occasions by choosing the Express Shipping option at checkout. Or you can have your child`s or loved one's ACTUAL Handprint or Footprint captured for a treasured keepsake in "Custom Engraved Images". 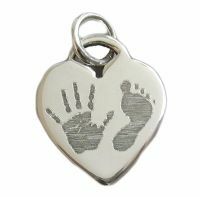 Simply email us a copy of your actual handprints or footprints images, and we'll create a truly custom piece of jewelry, exclusively for you. Please allow 2-3 weeks turnaround on these custom made items. We personally make these pieces in our studio using our own unique process of diamond engraved fine horizontal lines deeply into the piece. We use high quality Sterling Silver and solid 14K Gold in either Yellow or White for an heirloom-quality keepsake that will be cherished forever.